Well, it’s World Book Night 2011 and I have been spending the day so far logging numbers for the books I am to giveaway on http://www.bookcrossing.com and writing the numbers in the back of the books. Now I am hoping my printer actually works so I can print off the letter to go with them and then comes the delivering. The book in question is Seamus Heaney’s New Selected Poems 1966 – 1987 and I have decided to give two away via this blog. 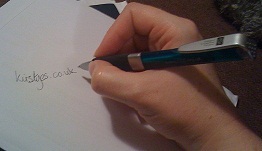 Why you would like to receive a copy and what you plan to do with it once you’ve read the wonderful poems it contains. This giveaway will close one week from World Book Night ( on Sat 12th March 2011, 5pm) and I will select the two winners and contact them to make arrangements for sending the books. Posted on March 5, 2011, in #am writing (and all things writing related), Kirsty rambles on about life, the universe, tv, and everything! 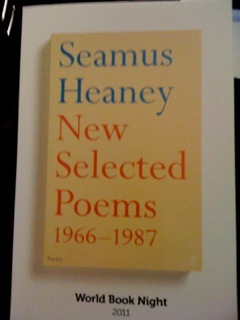 and tagged New Selected Poems 1966 - 1987, Poetry, Seamus Heaney, WBN2011, World Book Night 2011. Bookmark the permalink. 5 Comments. I love reading, writing and would love to have a copy of Seamus Heaney’s New Selected Poems.Should I be lucky enough to win one, I would read it and share the poems with my children who also love to read and write. I will read them with interest and try to learn from his technique. I may even buy a copy myself and gift it to a random stranger. Saw the comments about your special book giveaways well done. Now I’ve found Book Crossing I may well use that as an excuse to buy some Kindle books and pass the hard copies on. Thanks for entering – good luck. I would love a copy of Seamus Heaney’s work, as I love reading poetry. I have never used bookcrossing before, but I will be happy to log the book if I am lucky enough to receive one and then send it on it’s way. Thank you for taking part in what I perceive to be a valuable undertaking: the distribution of free books on World Book Night. Thanks Simone. Will let you know about the giveaway on Sat. Congrats Effie and Simone, you are the winners. If you get your address to me (Effie I have yours) at kirstyes@gmail.com then I will post out to you on Monday. Thanks for your interest and hope you enjoy the book.